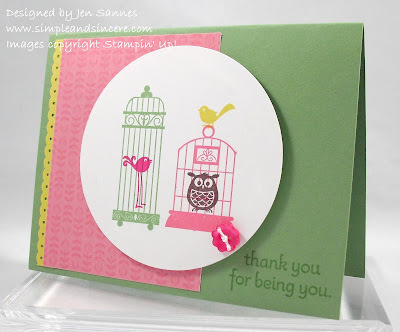 I've had this stamp set (Aviary) sitting on my shelf for some time, so I was excited to ink it up yesterday. These colors are so fun and whimsical: Wild Wasabi, Regal Rose, Daffodil Delight, Chocolate Chip and Melon Mambo. I used some of my Sweet Stitches dsp from the Occasions Mini catalog, along with the Dotted Scallop Ribbon Border punch to tie it all together. I hope this card brightened your day. See you again soon! This is soooo darn cute! I love the colors and the images are adorable. So cute and very spring like! !